You'll be happy to hear that Alice's puke-fest yesterday morning was an isolated incident and it didn't affect anyone else in our house. I did spend the majority of the day, though, thinking, "Wait... do I feel nauseous? Oh man. I think I'm sick!" But nothing ever came of it so obviously it was all in my head. With just a few days until we leave for the Trail Running Festival in Fruita, CO, I'm starting to finalize my packing list for my 50K. The list of what I need to bring is about the length of my arm so I won't bore you with the nitty-gritty but here are just a few of what I believe to be essential whenever I head out for any length of trail run. A lightweight and breathable hat is crucial to lessening sun exposure and keeping cool as the temperatures climb. And I always run with a bandana either around my neck to ward off the sun or tucked in a pocket to use as a bandage in case of a fall or to fill with ice to be used as a cooling device. It's no secret that I am a nerd for sunscreen. Choose a long-wearing sport variety that is water and sweat resistant and apply it liberally to your face, ears, neck and chest. I like to keep a chapstick with sunscreen in a reachable pocket for my lips, of course, but also for my ears and nose as a quick re-application. And if you've ever had chafing then you know how important Bodyglide can be. Never leave for a run without it. I've run with many a hydration pack and this one wins, hands down. The Nathan Sports Hydration Vests were designed by trail runners for trail runners and, after hours of wearing mine, my neck and shoulders aren't screaming from carrying a few liters of water over many miles. And those front pockets are perfect for storing chapstick, snack bars, and a cell phone (for shorter runs on trail or road, I love this little waist belt). Having run a few ultras before, you'd think I'd have my favorite sock-and-shoe combination figured out but this area of my training is still a work-in-progress. I did my 20-miler a few weeks ago in the Ironman Wigwam socks and the Altra Zero Drop Lone Pine trail shoes and came away with no blisters or lost toenails (!!). But we'll see what adding another 11.1 miles does to my feet. And to keep menacing dust and blister-inducing rocks out of my shoes, Dirty Girl Gaiters are the only way to go. So there you have it! 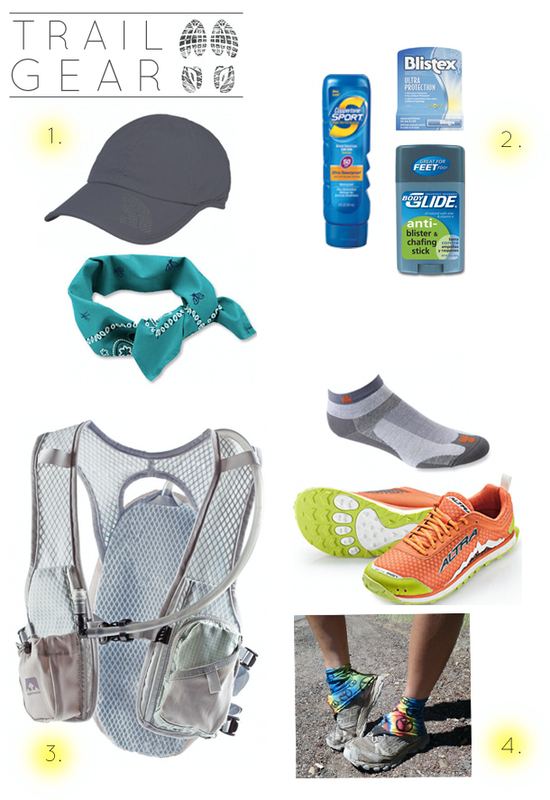 My must-haves for trail running. Anything you'd like to add to my list? Hurry up! Race day is rapidly approaching. And who could forget the tragedy that happened on this day last year.... Boston forever strong. Best of luck for the run this weekend. Sounds like you have it all under control & well prepped! Those Dirty Girl Gaiters! How clever! I've never seen such a thing before and it seems so useful.